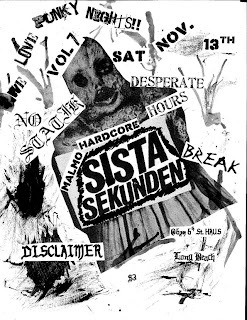 Thank you to all who came out to the Long beach 6th Haus on Saturday for the Sista Sekunden show. It was a blast to see everyone there, all of the bands ruled hard that night. Thanks again for making "WE LOVE PUNKY NIGHTS Vol 7" so much fun! See you at the next show @Garbage Grove Haus w/ MAUSER! !